Regardless the gender whether male or female, a pepper spray is a must-have tool for self-defense. With this spray, you are able to defend yourselves from large animals such as dogs and bears as well as suspicious people on the streets, especially during the night (pair it up with a pocket flashlight!). Also known as a capsicum spray, it contains a lachrymatory agent that irritates your eyes. It is a non-lethal weapon that causes tears, temporary blindness, breathing difficulty and pain upon directed at your target. The reason why it’s so popular among everyone at all age ranges is mainly because it is easy to operate and very inexpensive (compared to buying a gun or pocket knife!). With this product, you need not possess any particular skill to operate it while defending yourself, therefore it is a convenient and reliable method, in my opinion. However, for it to work effectively, you need to get the best self-defense pepper spray as well as know how to utilize it correctly. The factors affecting its performance are its shooting range, number of shots, size and shelf life. It is best if your spray is lightweight, so you can simply put in your backpack or pocket without weighing it down. In terms of size, it should have a compact size to ensure that it is highly portable to fit in your pockets, thus able to provide you with quick access during any emergency situations. Some products comes with key rings or hand straps to further improve its portability for your convenience. Others comes in pistol-like designs in which need to be paired with holsters to hold it securely in place. Nevertheless the size, it should allow quick access and smooth retrieval at all times. The firing range is the distance you are able to fire your pepper spray from. In my opinion, there should be a safe distance between yourself and the assailant. Ranges of about 8 to 10 feet is good enough for you to take a good shot as well as keep a safe distance. Too long of a distance will just be futile. This is because the accuracy of your shot will be significantly low. Hence, you’ll just be wasting your pepper spray without actually hitting the face of your target. Note that each shots are usually considered half a second long. So, if the spray canister contains 25 bursts of shots, you will only be using it for 12 seconds in total. With higher shots, you are able to use it for multiple occasions. It also comes in handy if you are fending off a few assailants or for you to try a few test shots. However, it is good to get water-based solution fillers to practice, rather than actually using the pepper solution. This product is available in either black or pink finish, in which you can choose according to your personal preference. It comes with a reliable and adjustable hand strap which ensures that it is immediately accessible during an emergency situation. In other words, it offers practical protection as well as immediate deployment. Furthermore, it has a shelf life of 4 years from the date of manufacture, hence you are able to use them for a long time especially if you don’t have the need to use them frequently. This product is also equipped with a free how-to-use video, which you can access on Sabre’s social media conveniently. It is ideal for both indoor and outdoor use. When used outdoors, it prevents the wind backflow once it is deployed, therefore preventing the wind from altering the direction of the spray. That being said, it only affects the target directly which comes in handy to make indoor cleanup a lot easier. This product provides ultimate protection against multiple threats, from a safe distance. You need not worry as your safety is guaranteed up to 10 foot. In other words, you are able to spray up to a 10 foot range, with a powerful stream that can last up to 35 bursts. Also, it is equipped with a UV dye feature which comes in handy for suspect identification. It is best if you practice with the pepper spray beforehand, rather than waiting for an unfortunate event to unfold. Therefore, you will most likely act quickly, aim and fire confidently at the eyes of the attacker. You just have to depress the trigger with your bare thumb in order to steadily spray it. Apart from that, this product is rather portable. Due to its small and compact size, you are able to keep it in your pocket. Its light weight won’t be a burden on your wrist especially if you plan to strap it onto your hands. The Police Magnum pepper spray has a unique pack of two (0.5 ounce each) keyring style product. In other words, it is equipped with a practical keychain-like ring at the end to attach it to your keys or purse conveniently. Therefore, you need not worry about accidentally dropping it anywhere due to its small and compact size. Apart from that, it has an ultraviolet (UV) identifying dye to provide subject identification. In other words, you are able to identify your attacker later with ease, with the UV dye still marked on the attacker. This will come in handy to find your culprit, possibly hours after the attack. The spray fires up to a range of 8 feet, nevertheless you should ensure that you fire it accurately onto the face of your attacker. In addition to that, you get 7 shots in the spray can, so be wise in using them. It has a safety top to prevent accidental discharge. The safety top, also known as the flip top feature prevents the top cover of your bottle from opening when placed inside your bag, hence preventing any wastage of your product. That being said, the locking mechanism on the top prevents any accidental firing. The top can turned on and off. However, they are said to get easily out of the lock mode so keep it safely in the right place to ensure it is tightly locked. Furthermore, its operation is rather simple. Bear in mind, you need to always test it before making the purchase, because the last thing you want is to find that your spray can is empty. A small step of testing it before buying it makes a lot of difference and hence why, you should practice this precaution. The OC-17 police strength on the other hand consists of the OC (oleoresin capsicum) solution, which is used to irritate the eyes of your attacker, whether people or animals. However, it is not lethal so don’t hesitate to use it of you are in trouble. Also, the solution itself is non-toxic and non-flammable. This product comes with a UV dye feature which comes in handy in the identification of your target. In other words, it leaves an invisible marker on your attacker which in return assists the police in finding your attacker, to do you justice. Moreover, it utilizes the power stream spray pattern. You are able to stream spray this product in the range of up to 20 feet. It has a maximum number of 7 sprays, so you can use them for more than one occasion conveniently. Also, it is said to be a little bulky to fit your pocket. It consists of 10% OC pepper formula. The OC stands for oleoresin capsicum which is a naturally made chemical derived from hot peppers to give the best effect in eye irritation and an intense burning sensation to your skin, therefore serving as one of the best self-defense weapon. The OC formula on the other hand is contained in a replaceable cartridge. The cartridge comes in an advanced bag in a can technology which comes in handy in terms of convenience, as you are able to spray a constant stream at any angle, according to your preference. In addition to that, you are able to refill the pepper gun with easy to load cartridges. It is well worth your investment as you just need to buy the refills, without changing the pepper gun itself. Also, each pepper gun has 28 grams worth of OC cartridges, water practice cartridges as well as batteries for the LED light operation. The trigger-activated LED light on the other hand allows you to accurately aim the pepper gun during the night, especially under low-light conditions. It also disorients your attacker’s vision, therefore giving you a few second of heads up before firing on your attacker. In terms of operation, it is rather simple. You just need to load it and pull the trigger to shoot the pepper liquid with ease. It is best if you practiced using the water practice cartridges included, to familiar yourself with this self-defense tool. For the user’s convenience, this product provides free training tutorial videos. Its packaging includes links to access training videos as well as publicly available safety tips when handling this pepper spray, on the Sabre main blog. You just need good Internet and you’re good to go, especially if you are a first-time user. It provides easily accessible protection against various type of threats, either from wild animals or dangerous people. In other words, you are able to access this spray with maximum ease during an emergency situation. In addition to that, it is equipped with an enhanced safety feature. This is because the pepper gel does not atomize like the conventional pepper spray, therefore will eliminate any wind blowback. That being said, it only affects what it directly contacts which in your case, your target. The UV marking dye feature comes in handy for suspect identification as leaves an invisible mark, thus making it a lot easier for the law enforcement to catch your culprit. Not only that, it offers a higher shooting range (20% more) of 18 feet/5.5 meters, thereby ensuring your protection at a safer distance. Moreover, it has 4 years of shelf life, so it will benefit you if you don’t frequently bring/use your spray, as you are able to use it when needed in the span of 4 years. Bear in mind that it is extremely important to test your products before buying them so you are fully satisfied with them. This product comes with a free nylon belt holster for immediate access. The belt holster on the other hand has 18 bursts in total, and a flip top safety mechanism to prevent any accidental discharge. In other words, it has a great trigger mechanism as a safety feature. It comes in handy to prevent accidental firing of your spray, especially when you keep them in your pocket or backpack, and tend to move around a lot. Also, this feature prevents the wastage of your pepper solution if it accidentally leaks out. First things first, this product has a unique feature, in which it comes with a green marker dye, instead of the common UV dye for suspect identification. Though invisible, the green marker will stay on your assailant, therefore making it easier for the cops to identify your attacker. Weighing 1.5 ounce, it is rather lightweight. It has product dimensions of 4 inch in height as well as 11/8 inch in diameter. That being said, its small and compact size makes it highly portable so you can transport it with ease in your pocket or backpack, as it doesn’t take up much storage space. Furthermore, it is best you get a holster with it to ensure that it is tightly secured at all times, without any chances of it accidentally dropping to the ground due to its petite size. Also, it comes with a heavy stream spray patterns which has a projection range of 12 up to 15 feet, thus keeping a safe distance between you and your attacker. Its large nozzle opening on the other hand is able to disperse a fair amount of pepper spray, therefore serving as an effective self-defense weapon. Not only that, it contains 16 to 18 second bursts of spray so you can use it over more than an occasion for your convenience. It is best if you try practicing with water-based solutions to prevent wasting the pepper solution. Besides that, it has 3 years of shelf life from the date of manufacture. Nevertheless, it is recommended to get a replacement after 2 years itself. This ‘H20C’ product basically consists of a green, water-based spray formula which contains organic pepper resin, to give the best burning effects. Weighing 1.5 ounces, this stream spray has dimensions of 4 inch in height and 11/8 inch in diameter. Its small and compact size on the other hand makes it highly portable, therefore making it convenient for you to store it in your pocket or so, for immediate access during any emergency situations. It has approximately 18 half seconds burst so you are able to use it for a few occasions. The heavy stream pattern style on the other hand projects to the range of 17 up to 20 feet, to ensure there is a safe distance between yourself and the assailant. The stream pattern style is suitable for outdoor use as it is least likely to be affected by wind or rain. However, you need to aim accurately at your assailant’s face for the pepper spray to play its role. Apart from that, it is equipped with a flip top safety mechanism, which comes in handy to prevent any accidental discharge or firing of your pepper spray. In terms of expiration, it has a shelf life of 3 years from the date of manufacture. Nevertheless, it is best to replace the spray after the second year itself for better performance. All in all, it is deemed a perfect self-defense weapon as it really stings your eyes, hence really effective in nailing down your attacker. The operation is rather simple. You just have to place your finger or thumb under the top followed by depressing the button for the powerful blast of pepper solution, onto the face of your target. Also, it is best if you get a proper belt holster with this product so you can store it conveniently and securely in your pocket. 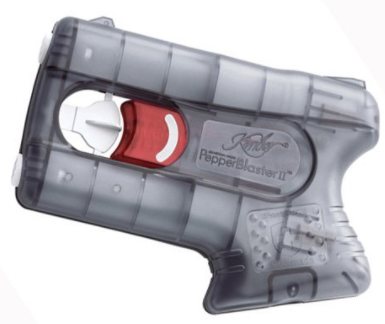 First things first, the Kimber pepper blaster is unique compared to the other traditional pepper sprays. This is because this product fires a capsule of chemical, which then explodes by force when in contact with the target, therefore providing an extremely intense burning sensation to your assailant. It is easily concealable, since the pepper blaster resembles a subcompact pistol, based on its shape. In addition to that, it is best if you purchase a holster to hold it securely and conveniently, for quick access and smooth retrieval during an emergency situation. All in all, it is a great non-lethal option for self-defense. It travels up to 13 feet range in 1/10 of a second. The delivery speed on the other hand is approximately 112 mph, therefore keeping the blast accurately on your target as it will least likely face any issues such as loss of pressure, drifting or blowback. Moreover, its ergonomic grip and sights allows you to hold and position it securely so you get an accurate shot. That being said, its pistol-like contours fits perfectly in your palms to ensure quick access at all times. Also, it has a shelf life of 5 years. This product contains an incredible ingredient formulation which combines 10% OC solution together with benzyl alcohol for maximum viscosity. The 10 % OC solution is good enough to provide good eye and skin irritation to your target. However, it has only 2 shots capability. After that, it can’t be reloaded. A pepper spray is a must-have self-defense tool. It comes in handy during any emergency situation, therefore providing you with a higher chance of escaping your attacker. The operation is rather simple, unlike carrying a gun. Despite being small and inexpensive, it does good damage! I hope my review assists you in making the right decision according to your preference. Check out our top rated boot knives here for self-defense.